There are times when you would like to generate an intensely bright flash of light using electrical power from the AC line. The circuit below can drive a one to three watt power LED with about 350ma of peak current. Since the circuit drives the LED with a constant current, any LED color can be used. 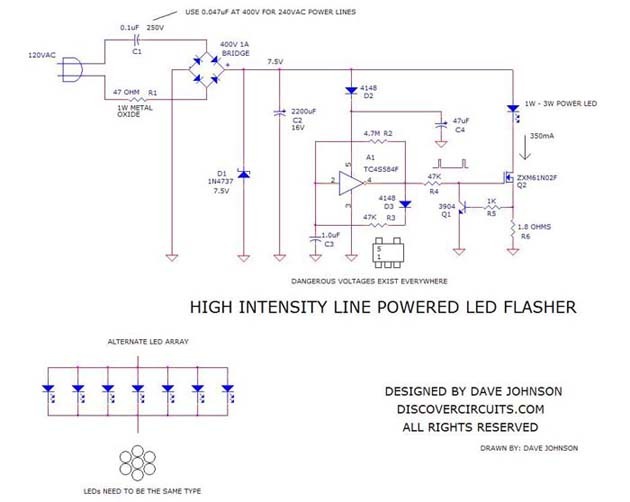 I have also shown how you could use an array of 7 LEDs, wired in parallel. This array may not produce as much light as the single power LED but the array would be cheaper to build. The circuit uses a classic Schmitt trigger oscillator, which drives a constant current switch circuit. The components are selected so the circuit produces a short 20ms flash with a flash rate of about 0.5Hz. A high voltage capacitor in series with a bridge rectifier limits the current drawn from the power line to about 5ma. A 47 ohm metal oxide resistor is used as a fuse. Since the LED current pulse packs quite a bit of energy, a fairly large 2,200uF capacitor is used to collect and store energy from the power line between flashes. The capacitor voltage is limited by a zener diode to 7.5v. A diode and capacitor circuit isolates the oscillator voltage from the main energy storage capacitor. This isolation insures that the oscillator frequency and pulse width remain fairly constant.